Tyrell Williams looks forward to pairing with A.B. Published: Dec. 30, 2018 at 06:39 p.m. Published: Dec. 13, 2018 at 10:23 p.m. Published: Dec. 13, 2018 at 09:19 p.m.
Los Angeles Chargers wide receiver Mike Williams makes a huge catch for a 3-yard touchdown against the Kansas City Chiefs in Week 15. 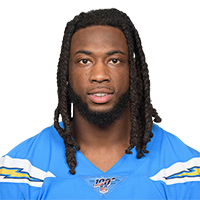 Published: Nov. 25, 2018 at 05:38 p.m.
Los Angeles Chargers wide receiver Mike Williams leaps for an incredible toe-tap touchdown catch.